What does USDA Organic mean? Why Does Berri Fit use organic ingredients? Berri Fit is USDA Certified Organic so free of GMOS, artificial sweeteners and colors. The organic label designates products produced under the Organic Foods Production Act. Organic products like Berri Fit cannot contain antibiotics, hormones, genetic engineering, radiation, or synthetic pesticides or fertilizers. Without labeling, there is no guarantee of these practices. What is the difference between a fitness beverage and a sports drink? A sports drink is made for competitive athletes who need the high carbohydrate (sugar) and sodium content to compete in high-intensity endurance environments, such as marathons and triathlons. Sports drinks today are artificially made in laboratories. A fitness beverage is made for casual athletes and fitness enthusiasts who want a healthy option to hydrate and refuel. This group often consists of yogis, weekend warriors and active kids, who do not need the high calorie and sugar content associated with artificial sports drinks. How many calories are in a bottle of Berri Fit? There are only 60 calories in a bottle of Berri Fit!. How many grams of sugar are in a bottle of Berri Fit? There are only 12 grams of sugar in a bottle, which is naturally occurring from the organic fruits, manuka honey, and agave nectar inside Berri Fit! Are sugar or artificial sweeteners added? Berri Fit is sweetened with certified organic manuka honey from New Zealand and certified organic agave nectar. There is no sugar added in Berri Fit. Berri Fit does not use artificial sweeteners like stevia or erythritol. When is the best time to drink Berri Fit? Berri Fit is perfect for active lifestyles and every day hydration needs. Made as a workout replenishment, Berri Fit is suitable for the casual athlete or fitness enthusiast whether you are a yogi, soccer mom or weekend warrior. As a low-calorie beverage, Berri Fit is also effective for weight management. Essential Ingredients like Maca, Ginseng, Manuka Honey, Maqui Berries, and Sea Salt: Berri Fit provides nutritional benefits from our premium ingredients that other sports drnks cannot offer. Why is Berri Fit better than coconut water? 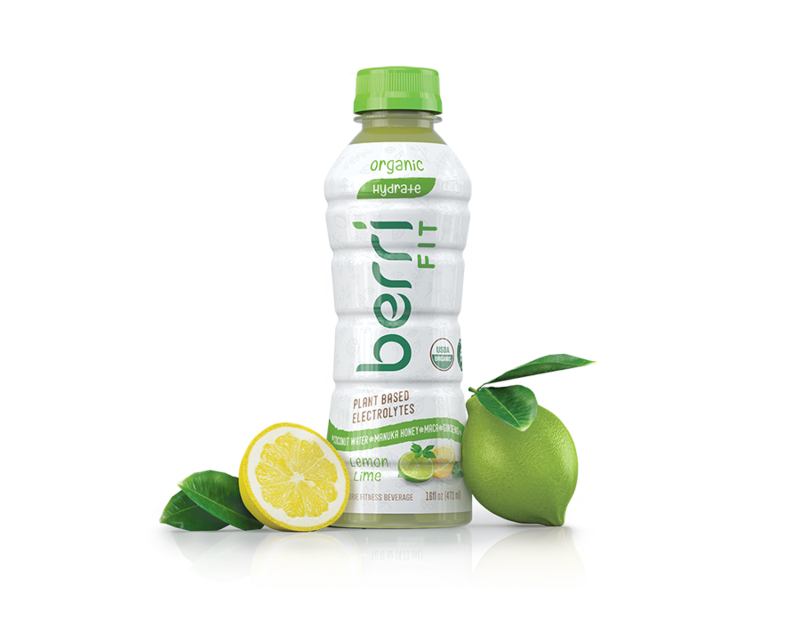 Calories and Sugar: Berri Fit has ½ the Calories and ⅓ the Sugar of Coconut Water. Not many people realize that coconut water like Harmless Harvest has the same calorie and sugar content as Gatorade. Essential Ingredients like Maca, Ginseng, Manuka Honey, Maqui Berries, and Sea Salt: Berri Fit provides nutritional benefits from our premium ingredients that coconut water alone cannot offer. Why is Berri Fit better than water? Ordinary Water has no electrolytes, which are essential for athletes and fitness enthusiasts. Water that contains electrolytes is artificially made with synthetic powder in laboratories. Why is Berri Fit better than tea? Tea has no electrolytes and is not an effective beverage option for fitness or sports. Why is Berri Fit better than cold-pressed juice? Cold-pressed juice has no electrolytes and is not an effective beverage option for fitness or sports. Cold-pressed juice often has 2x – 3x the calories and sugar of Gatorade. Never. Berri Fit’s organic certification guarantees all our products are free of genetically-modified ingredients. Is Berri Fit an energy drink? No, Berri Fit is not an energy drink like Red Bull or Monster. Why don’t you use glass bottles? And are your plastic bottles BPA Free? All Berri Fit bottles are 100% BPA free! We originally elected to go with plastic bottles because we didn’t want active kids running around and playing sports with our glass bottles in their hands. Over time we learned that plastic uses considerably less energy than glass to be recycled. Plastic is dramatically lighter than other bottle options, which means less fuel is used to create and deliver each bottle. Is Berri Fit sustainably produced? What’s the environmental impact? We maintain a low carbon footprint by locally-making our product in California. As a result of being USDA Certified Organic, our farms are pesticide and herbicide-free. The containers that we provide our fitness beverages are 100% BPA Free and recyclable. Does Berri Fit need to be refrigerated? How should I store Berri Fit? Berri Fit is best served cold and should be refrigerated after opening. Berri Fit does not need to be refrigerated prior to opening. Can I drink Berri Fit if I’m pregnant? Absolutely! Berri Fit is certified organic so free of hormones, antibiotics, pesticides, artificial sweeteners, colors, and GMOs. As always, we’d recommend you check with your healthcare team to ensure that Berri Fit is right for you. Can my kids drink Berri Fit? Absolutely! Berri Fit is certified organic so free of hormones, antibiotics, pesticides, artificial sweeteners, colors, and GMOs. Why does your beverage separate? Berri Fit does not use any preservatives. As a result, on occasion our beverage will naturally separate. Make sure to shake well! Can I drink Berri Fit after it passes the expiration date? We do not recommend drinking Berri Fit after the expiration date.